We Should Cocoa has been running a stunning four years now and today celebrates going into its fifth year. Yes, it was five years ago that Chele and I started this monthly chocolate challenge. Chele kicked us off way back then with raspberries and it’s been a continuous journey ever since. In 2012 Chele withdrew from the challenge and it has subsequently been kept alive by many wonderful bloggers who have kindly taken on guest hosting duties. This has added an extra element of creativity and interest as every host has such different ideas as to what the ingredient or theme should be. It is with deep gratitude that I’d like to thank all of the hosts and the many other bloggers who have been involved with this challenge over the years and have contributed to making it such an enjoyable and successful blog event. Do please keep those offers of hosting coming in. If you haven’t caught up with last month’s marshmallow challenge over at Bake n Quilt, please do have a look. So as this is a celebratory anniversary for We Should Cocoa and as it is the preserving season, what could be better than jam as this month’s ingredient. Just think of those classic Victoria sponges with that layer of luscious jam. But please don’t limit yourselves to just a jam sandwich. Jam can be on top, in the middle or a part of your creation, it can even be underneath so long as it features somewhere. And remember we’re not just talking about cakes. For me it’s jam tarts, roly polies and Queen of puddings that spring to mind; don’t be limited to the obvious however, let your imaginations run riot – but perhaps not your jam. Entry is via the linky at the bottom of the page and you can catch up with how to join in on the We Should Cocoa page. I thought I’d been rather daring with my fig and pomegranate jam followed by apricot and vanilla jam a couple of years ago, but I reckon this year beats it. I may have made a straight forward plum jam, which whilst being delicious wasn’t particularly innovative, but I also made a wonderful blackcurrant and chilli jam followed by chocolate jam. There has been much talk recently about chocolate jam on the Twittersphere and for the first time chocolate was one of the categories in the World Jampionships this year. 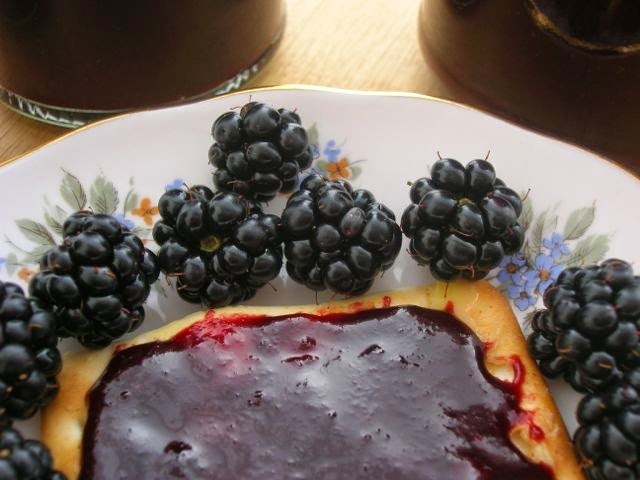 Even Vivien Lloyd, queen of jams has recently made a chocolate and raspberry jam. 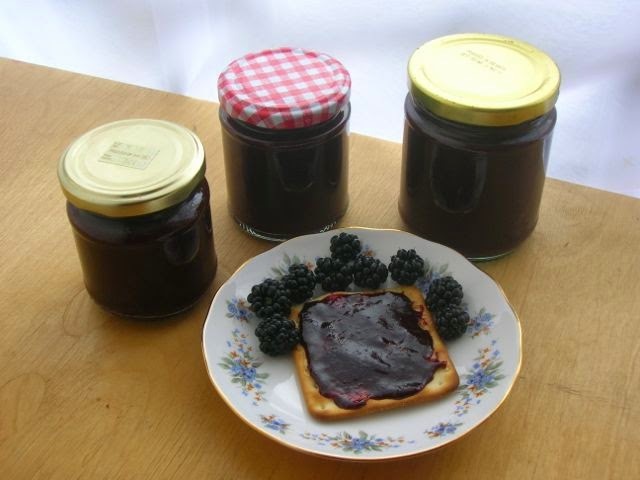 I like to do at least one seasonal blackberry post each year, so chocolate blackberry jam it had to be. Never having made anything quite like this before, I was a little concerned that it a) wouldn’t work and b) wouldn’t taste good. I needn’t have worried. It was a breeze to make and tasted great. It set well and had a good jammy texture. The balance of fruit to chocolate was just right; the flavour of blackberry was very much present, but there was no mistaking the presence of chocolate either. Seedless blackberry jam using apples to help it set with a big slab of chocolate added prior to the jamming stage. Wash the apples and cut into chunks including the skin and cores. Simmer in a pan with a little water and the blackberries until soft (about 10 minutes). Press through a sieve, extracting as much pulp and juice as possible. Return the extracted juice to a large clean saucepan and add the sugar. Heat gently until the sugar is dissolved. Boil rapidly for about 5 minutes until setting point is reached. I use the wrinkle method – place a little of the jam onto a very cold saucer and push your finger slowly through the jam to see if it wrinkles. If it does, it’s ready. That sounds like a wonderful combo! Who wouldn’t love this?! Sharing…we all need a little more chocolate in our life! I remember it starting!!! Happy Anniversary and well done-here’s to the next 5! Five years is an amazing feat! Congratulations on making it last so long. This is definitely one of the harder challenges for me, but I’ll give it a whirl. I can’t believe We should Cocoa is entering its 5th year. Well done for making this a success! It is a lovely challenge. Hoping to bake a bit more with chocolate soon so I can enter some more recipes too. So interesting a blackberries and chocolate jam. I want to pick some blackberries now. Just coming back to the UK and looking forward to pick some and bake with them! It looks lovely! I had some beautiful raspberry and chocolate jam last year, but I think this smooth texture looks much nicer. Happy Anniversary to WSC. Love the idea of chocolate and blackberry jam. Will try my best to join in but am moving house this month and going away for my birthday so time is short. So funny, I was dreaming up this combination at the weekend, and here you have it in all it’s deliciousness. Yum. Happy wscc anniversary, I enjoy partipating when I can and look forward to seeing the contributions. Congratulations!! 🙂 This sounds awesome! The Chocolate and Blackberry combo must be amazing! 🙂 YUM! Chocolate and blackberry would definitely be the chocolate combination for me too! Yum! Congratulations and happy birthday We Should Cocoa…. Happy 5th Anniversary to WSC ! Wow! Love your chocolate & blackberry jam ! Awesome combo indeed!